Oshkosh, WI activists announce sanctuary campaign | Fight Back! Oshkosh, WI - On Feb. 24, a group of over 40 people gathered at the Opera House Square in downtown Oshkosh for a demonstration and march in support of DACA and immigrants who are under constant attack by the reactionary policies of the federal government. The event, organized by United Action Oshkosh, served as an opportunity to promote a message of solidarity to the immigrant community within the city and the surrounding area, as well as to announce UAO's initial campaign to get Oshkosh to become a sanctuary city. This entails non-cooperation by the local administration and law enforcement with federal immigration agencies like ICE. ICE policies dismantle families and spread terror among oppressed communities. 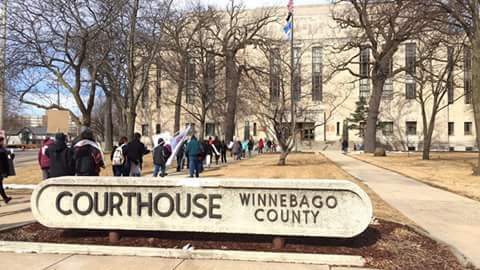 Participants gathered around the front steps of the courthouse to listen to speeches and comments from those who had something to say. A representative from the Student Organization of Latinos at the University of Wisconsin-Oshkosh gave a brief statement of solidarity with everyone there and with the organizers in UAO for hosting the event. UAO standing committee member Ryan Hamann gave a brief speech on the purpose of the rally and march, attacked the politicians in Washington for their stance on DACA and immigrants in general, and closed with the announcement of UAO's demand that Oshkosh become a sanctuary city. The campaign announcement was met with cheers and applause from the crowd. UAO is set to host another demonstration in response to the Trump regime's decision on DACA on March 5.